Lesson 4.2: Note-Taking Part 2, Key Information and Formats – How to Learn Like a Pro! Perhaps the most useful learning tools of all are notes taken from both lectures and course materials. By annotating for key information, then condensing it, students not only create personalized summaries but also aid their memory by using both visual and kinesthetic learning styles. Add auditory, too, if the notes are taken from a lecture or video. Other cues that alert you to when the information is of special significance (including verbal clues, below). Pay attention to when the speaker uses any of the transition clues used in reading comprehension, as listed in Lesson 3.3, context clues. Click on common clue words for a separate list. For tips on how to deal with fast talkers, when you should NOT take notes, what note-taking formats work well, and other advice, complete the exercise below. Download and read Study Tip #9-Taking Useful Class Notes, by Dan Hodges, found on the PDF file with all of his articles. Scroll down to #9. Number each of the 7 sections for easy reference. As you read, annotate (highlight, circle, underline, write marginal notes, etc.) for items that you especially want to remember from each of the 7 topics. 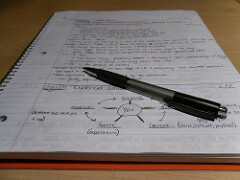 There are, of course, as many ways to take notes as there are note-takers with creative minds! For this exercise, do an online search using the key words, “fun and creative ways to take notes YouTube.” Preview as many as you like. Pick one (these are all fairly short), then take notes on it (!) in the creative way suggested. Be sure to cite the YouTube source (title and URL) in your notes.